I’m the first to admit that while I’m not what you can consider a true fan of The Smashing Pumpkins, I do really like their first 2 or 3 albums quite a bit. The guys I hung out with quite a bit between 91-95 listened to these albums incessantly, so they became ingrained in my brain. I also really enjoyed the drum work of Jimmy Chamberlin. The guy was a beast of a drummer on those recordings. Too bad he wasn’t with them last night. Last night marked the sold out opening of the Oceana Tour at Stubb’s in Austin, TX. While none of the original band is still in tact beyond Billy Corgan, they were solid. The sound of that show was pretty quiet compared to most shows I have seen there. But it was crystal clear and really just provided good background music as I was with a group of friends and we could still converse while the band was playing. The most impressive part of the show was that they played for 2.5 hours with the first hour being their entire new album. Pretty ballsy as most bands just intersperse new songs in with their classics. The low point of the set was his cover of Bowie’s Space Oddity. It just didn’t do it for me. I get in and see some good friends (don’t any of us have day jobs? – hahahaha). There were 2 acoustic guitars and 2 mics set up on the stage. Lita comes out with a second guitarist and they go through 4 songs. She talks a little between songs, does a little Q&A and tells some insight about the Runaways and Joan Jett. When she introduced her guitarist, Mitch Perry, my mind started running as I knew that name. The dude played in Talas, Asia, Schenker and some other stuff that we are all familiar with. She was really nice and snapped a picture with me. Her voice sounded good and she still looks like “Lita.” No Back In The Cave…that’s my jam. I’m really glad I went. No question. 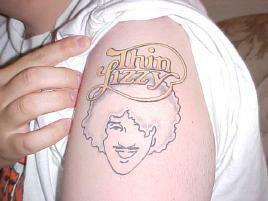 No secret about my fandom of Thin Lizzy. 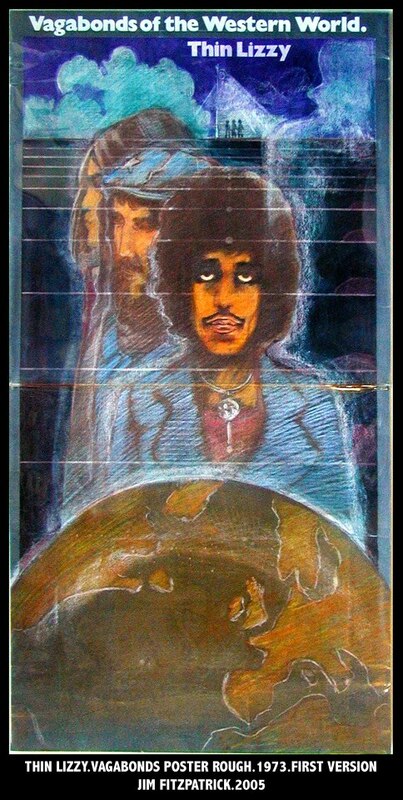 Recently their famed artist, Jim Fitzpatrick, released the history of the Vagabonds of the Western World album cover and gave me permission to post the entire thing on my site. 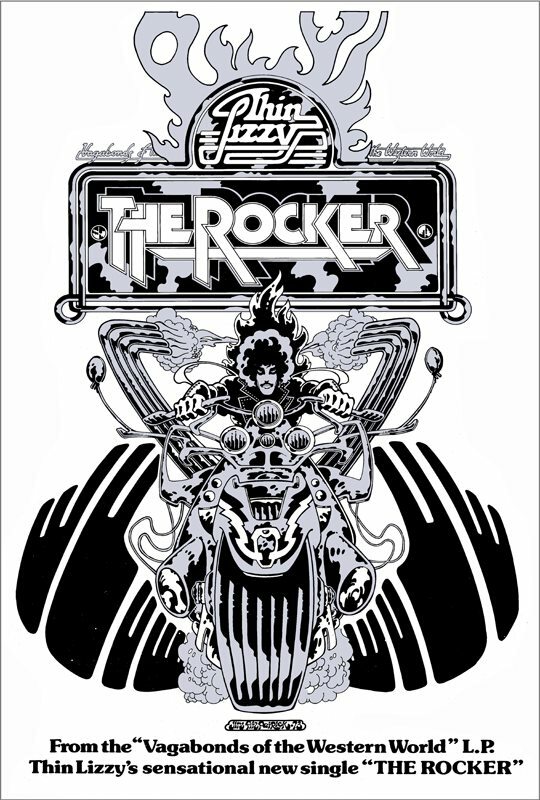 I first corresponded with Jim 10 years ago when asking permission to use one of his Phil Lynott images as a tattoo, which he gracefully obliged. VAGABONDS. THE POSTER. ROUGH. 1973. 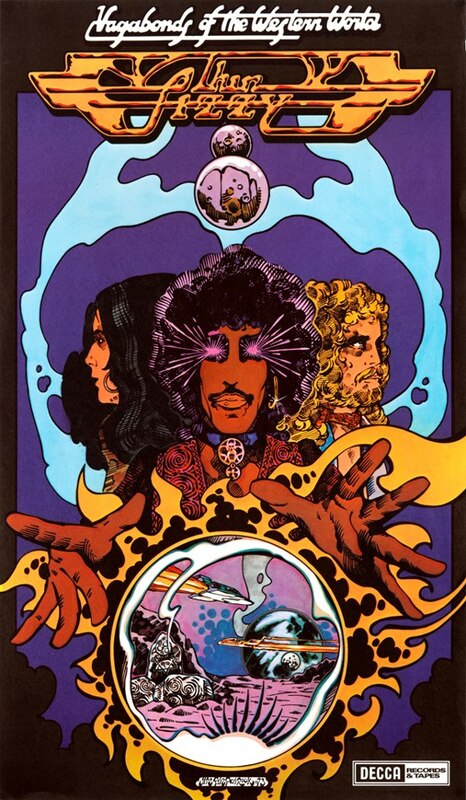 Philip loved the album cover art of Vagabonds and I got a hurried call from Philip and Thin Lizzy manager, Ted Carroll, asking me to adapt the artwork for a poster. We were working against time so I did a quick rough in marker ink and sent it over, Ted rang me and told me to work it up into a more developed rough. For speed I did the final rough in marker inks again and couriered it to London overnight. When I look at it now I find it stirring and interesting and it brings back so many memories. If I remember correctly I brought the final artwork over myself and stayed with Philip and his then girlfriend Gale in Wellbeck Mansions in West Hampstead, London. I slept on a light mattress on the floor of the front room. I’m lucky, I can sleep anywhere, then and now and back then the only thing I disliked was to be disturbed halfway through the night as happened a few times. Even my mate, photographer Tom Collins from Dublin, (Tom took my photo for the Vagabonds cover insert –and the famous Van Morrison shot in Sutton Castle for Van the Man’s album ‘Veedon Fleece’) turned up once, unannounced, in the middle of the night with two girls from, yes, Bristol, so you can imagine the endless ‘Bristol’ music hall jokes from a very witty Mr. Collins. The most annoying was this little jerk I took a total dislike to; a freeloader who no one seemed to actually know. He arrived back one night with quite a good-looking girl, woke me up to let him in and then camped on the couch across the room from me and humped all night. Halfway through I was woken again. I looked at him incredulously through sleepy eyes and I could feel my temper about to rise so I suggested where he could shove his effin music and if he did not then it was going up the hard way for him and his music. Never saw him again after that and when I told Philip he had no idea who the guy was. Philip, good-natured man he was, always kept open house and did so right up to his death. It was never struck me as a great idea, especially when some of these ‘guests’ were dodgy, druggy types and even an occasional thief, nicking personal and other stuff from the flat. Meanwhile Philip and Ted were much taken by the final artwork; Philip was beginning to see what I could do and had given me a free hand and it showed. The Vagabonds poster is easily some of my best work of the time. I love it still. VAGABONDS POSTER. UK ADS BLUE MARKER ROUGH. The influences are slightly more comic book than before and Philip loved that. My hero by then was Marvel comic book genius Jack Kirby and the hand gestures are very Kirbyesque while the look owes a lot to the original Spiderman artist Steve Ditko, a beautiful craftsman with a gentle style that leaves him a vastly underestimated artist today. Immediately I had also to prepare a series of press ads for New Musical Express and Melody Maker, the dominant music press of the day, all with huge circulations. This time the blue marker came out and I did all the roughs in the flat and used paste-ups of my line artwork for the poster for the final ads, chopping up sections in storyboard manner. They looked good too and when they appeared they were very effective. There were other odds and ends too. Not many people know this but Irish publisher John Coughlan, my near neighbour on the Burrow Road where I live and where Philip lived, was the first person to publish the poster. Philip and John Coughlan were mates and John ran a pop magazine called New Spotlight. Philip gave him the actual artwork and he ran it as a double-page spread in the magazine. The reproduction was not great but it was a buzz to see it in Ireland as the poster never made it over here. I still have a signed set of ten posters and ten albums signed by myself and Philip, and the receipt from Decca for them. I keep everything. One day I will even clear out the attic where I keep all the old stuff no one wanted. I told you here I met up and spoke to Frank Murray the other day. He spoke about how I got to do the ‘Vagabonds’ cover. The Inside Story of the Vagabonds Cover. aid to me; ‘Jim, you are missing a chunk of the story from the inside’. So off we went for a coffee in Bewleys and I recorded Frank on my iPhone. According to Frank Murray, Philip’s best mate and confidante, Philip was looking for someone to do the new album cover for Thin Lizzy. ‘The ‘New Day’ EP was done by a guy called Dave Rowe and I felt it was too hippy-trippy so I said to Philip, ‘I know an artist called Jim FitzPatrick in Ireland’ and that is how you got involved’. 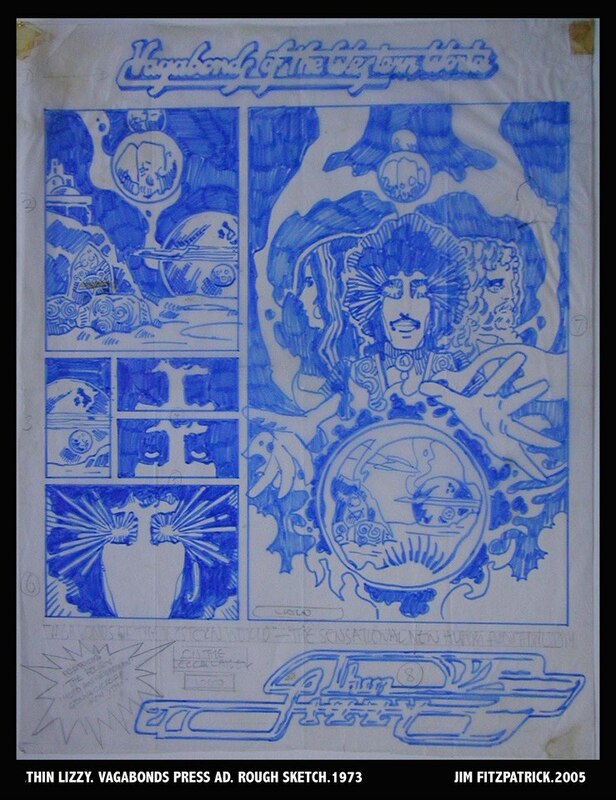 Both myself and artist Tim Booth were asked to do roughs for the forthcoming album and both Philip and Frank reckoned my more elaborate rough was nearer to what they wanted plus the fact that Tim was very busy with his own band, ‘Doctor Strangely Strange’. Frank’s understanding was that Philip knew Tim, probably didn’t know me but he knew my work, Tim was a friend and had done a Thin Lizzy logo for Philip while I was a friend of Frank from a few years before when we played football for a team called ‘Energy Reserves’, captained by Peter Fallon, now a highly regarded poet in Ireland. Peter Fallon was a friend who I collaborated with as an artist via Ireland’s only beat group, Tara Telephone; Peter’s brother B.P.Fallon was publicist for John Lennon and later Marc Bolan and T-Rex. We had a magazine/booklet published by Tara Telephone called ‘Capella’ and my work was on every cover, pretty wild stuff too, while luminaries like Lennon, Bolan, David Bowie, Allan Ginzberg and Adrian Henri all contributed their talents and verses for our modest little publication. Philip always had this literary instinct and it flourished in this early writing too. Frank told me over the phone the idea in their heads was that Lizzy were supposed to be some kind of band of rock ‘n roll gypsies, roaming vagabonds and general mischief makers. He gave the same brief to both myself and Tim and myself. ‘You came back, said Frank, with the most complete version (that was the gatefold idea in full colour) and Tim sent one; I forget what Tim’s idea was but I know it didn’t strike me immediately and I was getting on to Tim and saying ‘Can you do this, can you do that’ and Tim was saying; ‘How many of these do you want me to do?’ and there was the question of payment for so many roughs and add the time element with Tim being so busy always -all that would be a red rag to a bull to Philip, who just wanted it done. I remember ringing you again and telling you to add in the little totems Philip wanted, for himself, Eric and Brian (the little spider, frog and mouse) and you sent over the best design; I remember it was on tracing paper with little notes added all over it so when myself and Philip were on the plane to Dublin, Philip said to me ‘Well, what are we doing about the sleeve?’ I said, ‘well, we will meet up with Jim FitzPatrick and sort out the cover, Jim, I think has come up with the best idea, Tim is very busy at the moment, so we will meet up with Jim’. Philip replied ‘Ok, give him a shout and let’s meet up’, and that’s how it came about. ‘Wow!’ I said to Frank, ‘I didn’t know that’. 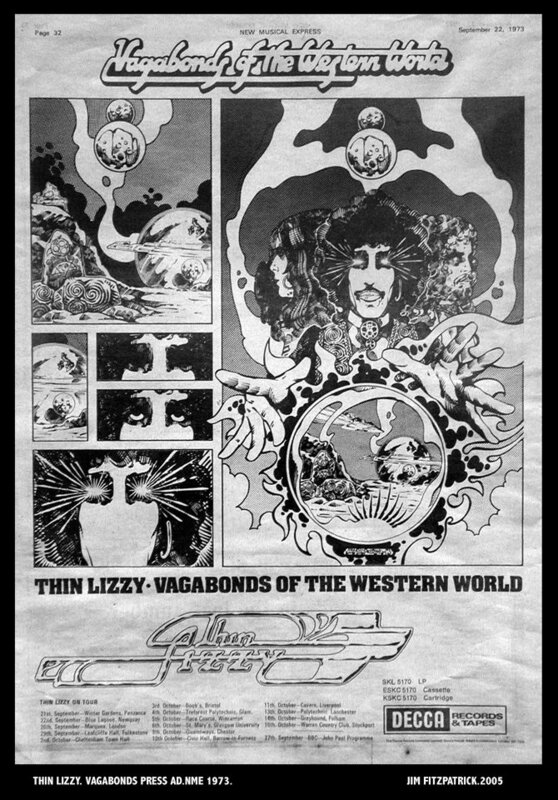 Philip loved the album cover art of Vagabonds and I got a hurried call from Philip and Thin Lizzy manager, Ted Carroll, asking me to adapt the artwork for a poster. We were working against time so I did a quick rough in marker ink and sent it over, Ted rang me and told me to work it up into a more developed rough. Philip and Ted were much taken by the final artwork; Philip was beginning to see what I could do and had given me a free hand and it showed. The Vagabonds poster is easily some of my best work of the time. I love it still.